If you want to preview one or more drawings that don’t have a corresponding list of cells in the Control Center’s database yet, you don’t have to go through the whole procedure of creating an environment, defining the jobs, scenes, and elements, and then creating an exposure sheet. These would be a list of cells that were not entered in the exposure sheet and do not appear in the Database Element Selector dialog box. To scan these new drawings, you must specify the path and file names for the drawings to be saved. NOTE The Scan application does not vectorize these types of digital drawings and you cannot view them in Control Center. If you do decide to use these drawings, you must follow the standard procedure for scanning drawings for a regular scene (with the Control Center and Harmony modules). Select File > Build Manual List. The Manual List dialog box opens. 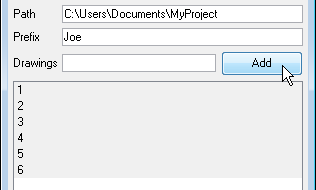 In the Path field, type in an existing directory path where you want to store the scanned drawings. Type in a name in the Prefix field that appears at the beginning of the scanned files that correspond to the drawing names you subsequently add to the manual list. NOTE The prefix and a dash automatically appear in front of the drawing names you add when the Harmony creates the files of the scanned drawings. Type the name of the drawing you want to scan in the Drawings field and click Add. The name of your drawing appears in the Drawings panel. Repeat for every drawing you add. For a quick way to create a series of drawings, type the first and last number with a colon (:) between them. 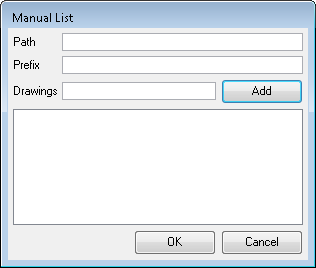 Select the drawings you want to add to the Drawing List. By default, all the entries appear selected, but you can select the drawing(s) you want to scan. The selected drawings appear in the Drawing List of the Harmony Control panel. NOTE To modify the manual entries in the Drawing List, you must reopen the Manual List dialog box and go through the process of building the manual entries again.